Like popping endless bottles of Bollinger and tins of crème fraîche & Beluga spooned with mother of pearl antique spoons onto buttery blinis, the New Year in Milan traditionally brings Concerto di Capodanno, where on December 31st, OC annually rings in the approaching year with a live performance of Beethoven's Ninth. OC's already strapped-on 5 pairs of towering stilettos (at times, in snow) yearly to celebrate at Milan's Auditorium di Milan with her homebeezy Ludwig Van. This year being no exception, OC found herself in Auditorium's plush velvet seats for Wayne Marshall's sold-out Beethoven Ninth, Gucci black platform suede wedges, Alexander Wang black satin mini-dress, J Brand The Deal leggings, vintage '80s Tiffany & Co. bracelets from OC's mom & her favorite vintage Cartier, and a black Burberry trench all kept OC toasty in the cold mist that blanketed the city last night. Oc's heard it all, every year an almost predictable reading of Beethoven's cultish 9th: 2005 brought us Herbie Blomstedt's adept & solid performance; in 2006 we heard Leonard Slatkin's sloppy mess; in 2007 the American maestro returned for a more careful read; and last year we heard Leopold Hager (filling-in last minute for an ill Vladimir Fedoseev), who dazzled us with Beethoven's Fantasia in C minor but fell short with the Ninth. This year, British maestro Wayne Marshall took control of Orchestra Sinfonica and Coro Sinfonico di Milano Giuseppe Verdi, and although we can't say it was particularly good, it was a fresh & witty & superfast reading of Beethoven's powerful symphony. This coming Thursday, at Milan's Auditorium Verdi, Wayne Marshall will conduct Beethoven's Ninth (it's his first time with the Ninth) in the classic December 31 concert @ Auditorium di Milano. Maestro Marshall (above, in English) talks about the Ninth. La Verdi's Maestro del Coro, Erina Gambarini, discusses the work, in Italian, after the jump. 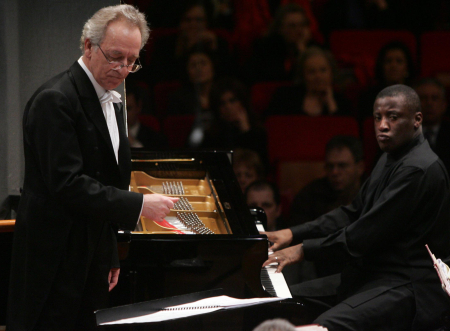 Maestro Wayne Marshall (pictured in the photo above with Opera Chic's Uncle Solly, aka Maestro Yuri Temirkanov) is not only a great pianist, an excellent organist, and a most elegant conductor, he also seems to have a special connection to Lenny's music. Opera Chic's milanese friends are still raving about a Marshall concert at la Scala in 2001 -- when, among Gershwin gems, he conducted an apparently incandescent Candide ouverture. Tomorrow night Maestro Marshall will lead the Accademia di Santa Cecilia orchestra, that most Bernsteinian institution, in Rome: the program will make Rosalind Russell's awesome ghost very happy, because it's Wonderful Town. In the cast, Kim Criswell, Catherine Torriani, Sebastien Lemoine, Vincente Ordonneau, Leroy Villanuava Wreck, Zachary Halley and Renata Palminiello.